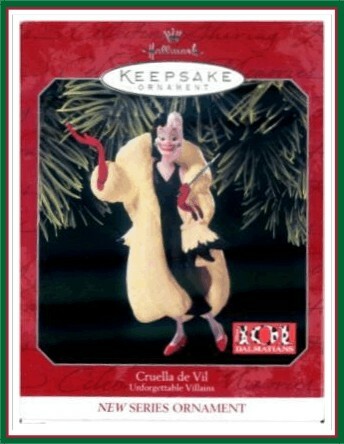 First (1st) in the Unforgettable Villains series - Cruella de Vil - Handcrafted - Dated 1998 - Sculpted by Joanne Eschrich - QXD4063 - Disney - 101 Dalmatians. It take a great villain to make a great story, and Disney creates some of the best! Colorful, crafty, and highly entertaining, Disneys villains are masterpieces of evil intent. They add suspense to the story and bring out the bet in his heroes and heroines. The diabolical Cruella de Vil is selfish, spoiled, and incredibly bad-tempered. Her desire for a special Dalmatian fur coat inspires parents Pongo and Perdita to hid their puppies in a most imaginative way. This ornament was the beginning of a Keepsake Ornaments series which feature a different villain from Disneys classic movies each year. MIB with normal box aging. Has Price Tag. This Hallmark Keepsake Collector's Ornament has never been displayed.